Like pools? Like movies? We've got the event for you! 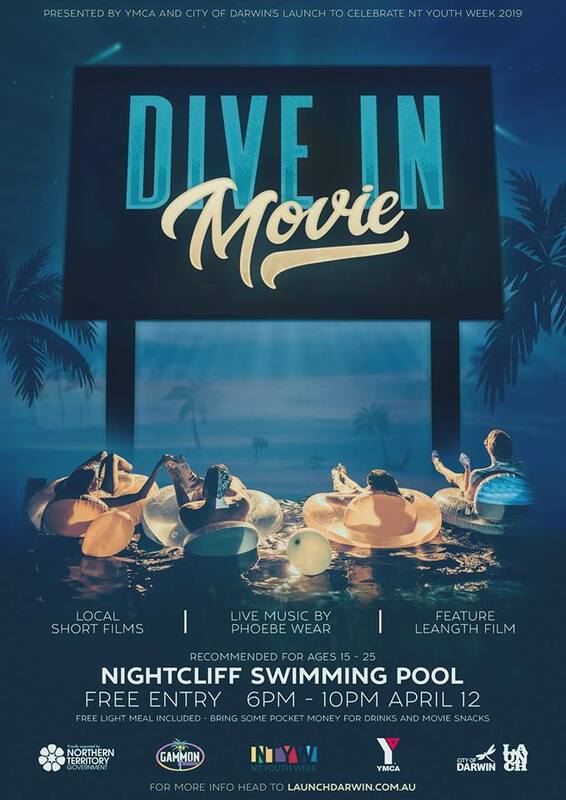 City of Darwin and YMCA NT are holding a Dive-In Movie for NT Youth Week 2019! Join us on Friday 12 April (6pm-10pm) at the beautiful Nightcliff Swimming Pool, and watch the sunset as you relax in the water or lounge poolside. We’ll be welcoming you all with a live performance from captivating local musician, Phoebe Wear. Then as twilight sets in, we’ll be kicking things off on the big screen by featuring a handful of short films by talented, local film makers Lexie Gregory, Thomas Midena, Nathaniel Kelly & Joseph Baronio. Followed finally of course by the main movie ~ stay tuned for the announcement of how you can help us decide which movie to show! On the night you can also enjoy a free light meal from Gammon Creations. Don’t forget to bring some pocket change for additional drinks or snacks from the pool canteen! —> Catch a bus! No. 4 Bus stops at Aralia Street: 500m away from Nightcliff Swimming Pool (~5min walk). On a Friday evening this bus service operates past midnight – see the links below for the No.4 bus timetables. —> Ride your bike! Bike racks are available out the front, remember to bring your bike lock! PS Bus travel to/from all Youth Week events is free for 12-25 year olds, you just have to show your bus driver the travel voucher on this page http://www.youth.nt.gov.au/nt_youth_week.html … download to your phone, screen cap, or print!